Along with Captain Beefheart抯 'Trout Mask Replica', Tea and Symphony抯 'Joe Sago', Wild Man Fischer抯 'An evening With Wild Man Fischer' and the GTO抯 'Permanent Damage' lie many unsung and criminally ignored masterpieces. One such is Orchestra Luna抯 eponymous debut. 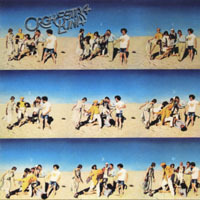 Described by one critic on its 1975 release on Epic as 'the soundtrack to a musical that never took place', Orchestra Luna is the first and only album by this innovative Boston based music/theatre outfit, whose modus operandi was a three-pronged one male/two female vocal attack with musical backing and spoken word contributions. Mixing poetry and music was commonplace then and practised by The Liverpool Scene, Occasional Word and Hawkwind with the late Bob Calvert. However, nobody quite achieved the fine balance of narration and music as Peter Barrett did with Orchestra Luna which worked into its repertoire an element of showbiz that harked back to Vaudeville and the glory days of early Hollywood musicals.